The pupils who attend Foundry College display a wide range of social, emotional and mental health needs which, by their very nature, can affect their progress. 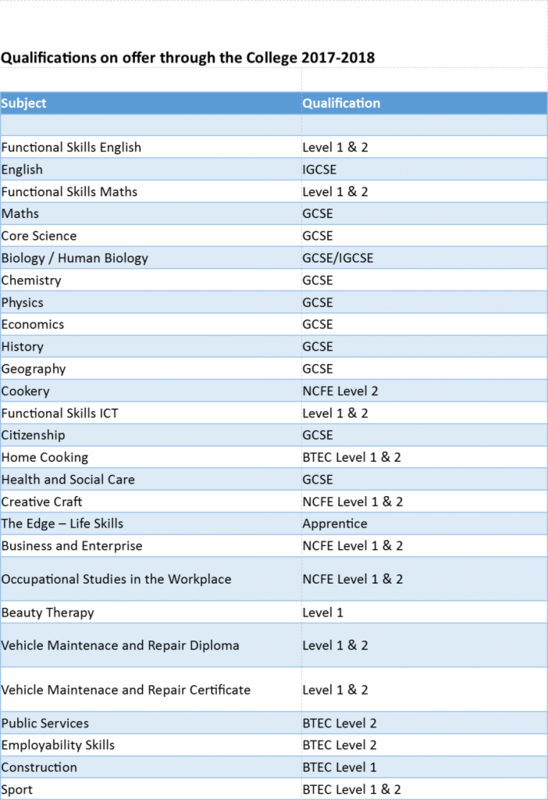 The college therefore provides a flexible academic curriculum that addresses all areas of pupil needs and supports the holistic ‘hidden curriculum” or Foundry Curriculum. All pupils study English and Maths, Wellbeing, including RE, and PE. In addition, pupils select other available options in response to their specific interests. The academic curriculum at Foundry College intends to promote learning and personal growth and development. It includes not only the formal requirements, but also a range of vocational and placement activities that the College organizes, both onsite and with outside agencies, in order to enrich the experience and address the challenges of the pupils. We aim to teach the pupils at Foundry College positive, responsible attitudes developing knowledge and skills, including social and basic life skills, so that they may become contributory members of the extended community. Subject plans address aims and objectives and long term plans, with particular consideration of the needs of young people with social, emotional and mental health needs difficulties in a diverse society. Long term as well as medium term plans are reviewed regularly in line with current curriculum changes and the changing needs of the college population.